With the development of the computer circuit technology the task of creating a portable computer suitable for work and entertainment is getting more and more real. Such computers are surely in demand. A lot of people need a computer, which does not require a separate transportation bag and which can be used to work in a car or to watch DVD during a lengthy flight. For today the problem of sufficient performance in notebooks with small dimensions is almost solved. The trouble is in the run-down time. Unfortunately, supercompact and sufficiently capacious batteries are not yet created. 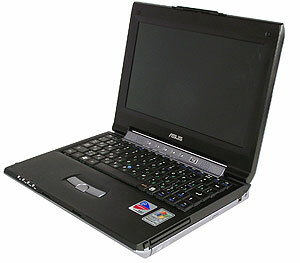 Nevertheless, notebook manufacturers produce supercompact models. One of the successful solutions is ASUS S200N. The next step in the development of this notebook class is the S300N model, which is positioned as personal digital entertainment center. 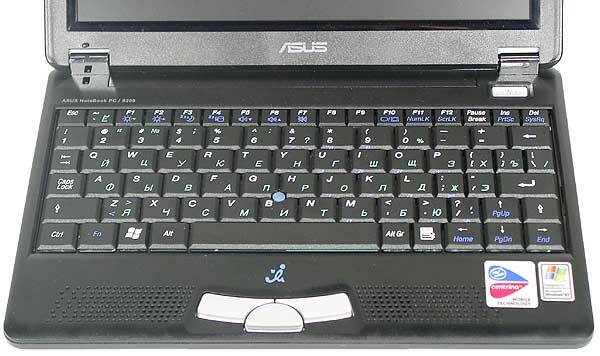 Unfortunately, at the time this review was written the company web site did not contain any information about this model, that's why its specification was provided by the Moscow representative office of ASUS. Yes, DVD recorder in a subnotebook  that's cool. But is it really necessary? We'll see. And now pay attention that in comparison with ASUS S200N the new model has grown up in size (235x177x31.5 mm versus 225 x 152 õ 27.8~29.8 mm) and put up considerable weight (1.3 kg versus 905 g). And more importantly it got rid of the built-in battery. Theoretically that's understandable  there is almost no room left inside. Notice that the mentioned weight includes the attached battery, and the dimensions are given nonmetering battery size. The design of the notebook has changed substantially in comparison with S200N, but several common features remain, for example, wireless LAN antennas on the display panel sides. Sharper edges replaced the sloped ones, grey metallic casing color . On the whole the notebook looks state-of-the-art, I would even say, aggressive. Battery shape also changed. Now it has lugs embracing the case, which prevents the battery from sliding along the case, and thus from breaking off its latches. The metal stub for the battery jack is also gone. The back of the case contains battery pack notches, battery connector and a kensington lock hole. Thus, when «attached» it can work only from the ac adapter. Most connectors are on the left side of the case. From left to right. Almost the entire right side of the notebook is occupied by the DVD drive. IEEE1394 connector and a DC power input jack are to the right, PCMCIA connector on top. There are no remarks to the connector layout, for such dimensions everything is grouped well. «Effective area» of the notebook resembles that of S200N, but with essential modifications. The keyboard remained the same shifted to the back, which, in combination with enlarged dimensions, made room for hand plates. As a result it has become much more comfortable to work with. The pointing device is also left the same. With this position of the keyboard it would have been possible to build in a touchpad (de facto standard), but ASUS engineers preferred a proven solution, which I don't at all regret  I liked it at once. Speakers also migrated to the back  this layout is more suitable for video playback. Built-in mic is located in the front left corner. If the AudioDJ control panel is unlocked, a corresponding LED blinks. This control panel works only when an operating system is loaded, you cannot play CDs when the computer is off. What concerns the record button, at first glance I thought it was a dictating mac button (the built-in mic contributed to this mistake). But it turned out that this button starts Nero Burning ROM. This function may come in handy, especially when you get used to it. Display brightness and audio volume controls are accompanied by current values shown on the display, main/battery power switch also displays corresponding icons. Everything is convenient and logical. Audio system copes with movies well. Dolby Virtual Surround distinctly modifies the sounding, but I didn't actually notice a special sound voluminosity  the stereo base is too small. Several words about the display. I liked the color rendition. Colors are bright, contrast is high. Viewing angles are sufficient for an individual, and you wouldn't want to watch a movie on this small display in a group anyway. Brightness range is wide. Movies are subjectively comfortable to watch at any lighting. 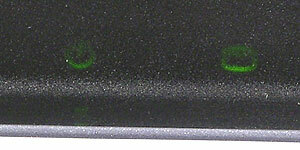 LED indicators are implemented as blinking icons in the front left part of the work surface, like in S200N. 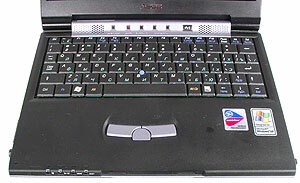 When a display panel is closed, you can see flashing stripes indicating the notebook status. To sum it all up, this model possesses almost ideal functions. The only missing element is a Bluetooth adapter to connect to a handset. Is ASUS S300N the best choice for mobile work? I wouldn't jump at this conclusion. We haven't yet examined another important parameter  battery life time. What's the use in all these functions, if you can use it only for a short period of time? The question of battery life will be answered in the "Tests" section, and now a few words about after-sales and information services. All ASUS notebooks come with a 2-year international warranty since February 2002. A complete list of service centers can be found on the asusnb.ru web site. The main authorized service center in Moscow is "Topaz-2M". This center hosts an online support service (10:00 - 18:00) at the following phones: (095)928-9717, (095)926-0775, (095)926-0658. 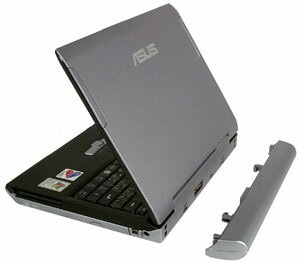 There appeared a russian web site fully devoted to mobile solutions from ASUS  www.asusnb.ru. Here you can find information about the models supplied to Russia and CIS, their configurations, and recommended prices. But still, you will have to open the global web site of this company to download the drivers. At the moment this review was written, no ASUS web site provided information about S300N. So, the most important feature for this notebook is the run-down life. Let's take for comparison results of ASUS S200N. Remember that S300N has a 2200mAh battery pack, and S200N has a 1250mAh built-in battery plus the ditto 2200mAh in an additional battery. 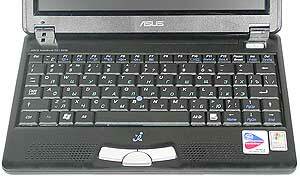 ASUS S300N software does not include the company utility for power management ASUS Power4Gear. According to the company representative, power consumption of Intel Pentium M ULV is small and the Centrino platform offers enough power management. What concerns the display brightness, a user can set the desired mode using the brightness control buttons. So the run-down time of S300N was measured with its power management settings set to Portable/Laptop (auto) and Max. Power Saving. 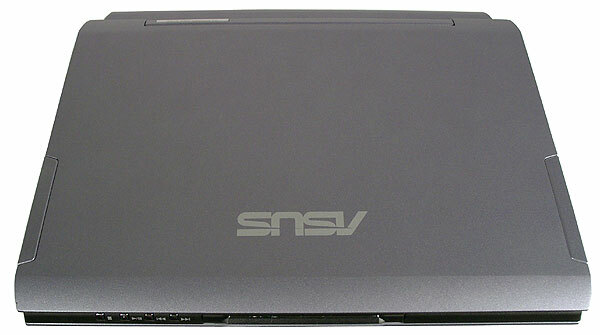 S200N was tested in the Portable/Laptop mode. Let's see the results. The results are expectable but still sad. The run-down time of S300N barely crosses the two hours' mark. If you disconnect the built-in battery from S200N, you will get approximately the same results. And still, it's too short. DVD playback time is still more of a disappointment. In 1 hour 15 minutes WinDVD refused to continue the playback by giving the battery low warning. Fortunately, DVD recording is not fiction  after I copied 4.6 GB from a Memorex DVD-RW to a new DVD, the battery usage was 46% (according to the OS data). So because of these results I called ASUS S300N "a toy". This notebook will do for a ride in your car, but for a prolonged trip...  alas... Though you can buy a battery of double capacity, which according to ASUS representative, extends the run-down time to 3.5 hours. But this measure will naturally result in enlarged dimensions, and thus to the weight increase. ASUS S200N and S300N demonstrate almost equal performance. The max. power saving mode, as I have noted in the previous reviews, mostly reduces the performance instead of extending the run-down time. The Centrino platform has good power management indeed. And now let's see how it operates on external power. A small performance advantage of S300N can be most likely explained by the DDR333 memory. So, what have we got? ASUS S300N is a nice, even spectacular model with a wealth of functions. But the run-down time with the standard battery pack is only two hours, for DVD playback - even less. If this notebook had offered 4 hours of battery life, I would have lost my mind. But at present I think it's just a toy. Nice, stylish, accentuating the owner rank. A real toy for grown-ups.